The bike rental will work in a test mode, reads the report. "The presentation will be held at noon. Rental locations are all over Kyiv. 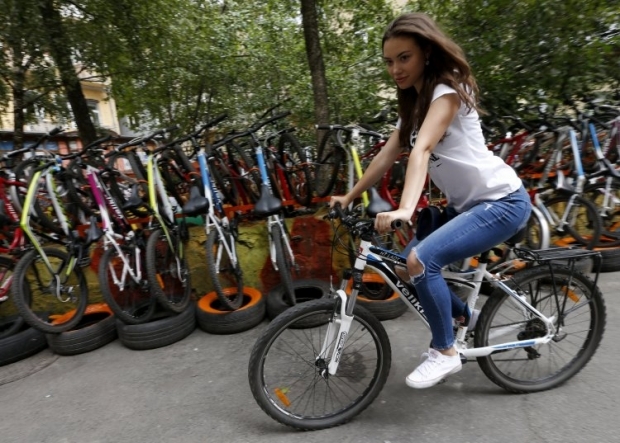 In general, there are eight locations with the municipal bike rental: 1B Obolonskiy Ave., Druzhby Narodiv Park (Park of Friendship of Peoples), 51 Dehtiarivska Str., 12 Baseina Str., 3 Raisy Okipnoi Str., 1 Glushakova Ave., 11 Kniazhiy Zaton Str., 1 Tronka Str. Working hours are from 08:00 to 20:00," the correspondent said. Read alsoUkraine's Interior Ministry mulling to install over 3,000 speed cameras on roadsAccording to a cyclist Andriy Malovatskiy, "in order to use the rental, you need to register on the website." "If there are any difficulties, you can call the hotline. You also need to load the app on your smartphone. After that, you need to scan the code, which is on the bike trunk, or enter an individual bike number," the cyclist said.